Colour really does make the room. The perfect shade and finish can enlarge a small space, bring in more light, or deliver that kick of energy you need with your morning coffee. But finding the perfect colour, well that's not always so easy. 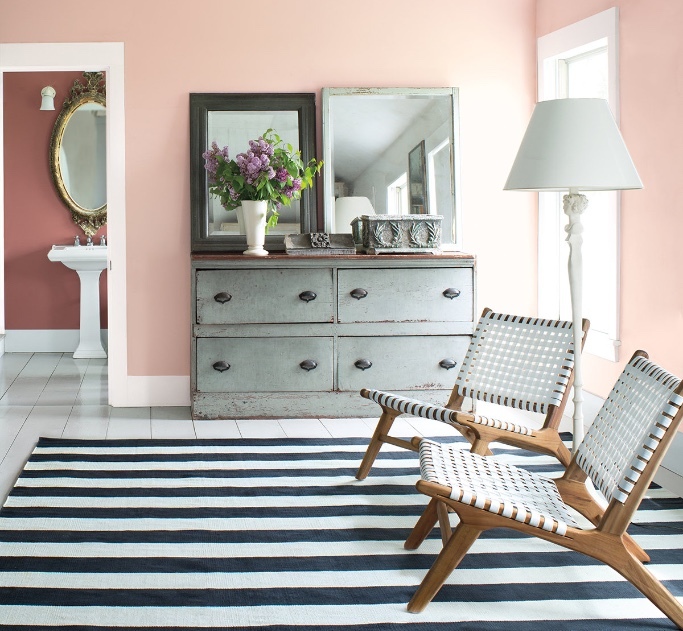 The Benjamin Moore Colour Handbook is packed full of essential tips and hints to help you feel confident you'll love the colours you live with. To get started, take a look at a colour wheel: Warm reds, yellows, and oranges congregate on one side, while cool lavenders, blues and greens are on the other. Pale tones and "hints" are at the centre of the wheel while saturated shades are found around the edge. Creating a palette within one half of the wheel tends to be more harmonious. But pairing two colours that stand opposite one another adds a dash of invigorating tension. A monochromatic colour scheme uses shades of the same colour with varying levels of saturation. An analogous colour scheme uses adjacent colours on the colour wheel, such as blue and teal. You want to love the colours that surround you. So when imagining (or reimagining) a room, remember to think about the influence colour will have on the mood of the space. The effect can be subtle or dramatic. It can encourage tranquility or boost energy, even make you feel optimistic or more introspective. The following 4 basic colour groups help us to understand how colour can influence mood. Their light, airy qualities make pale hues feel uplifting. Pale colours like dusty lavender, ballet pink and sky blue are comfortable and easy to live with. They feel positive and encourage expression, while enhancing other colours. Be inspired by our collection of flattering pales here. 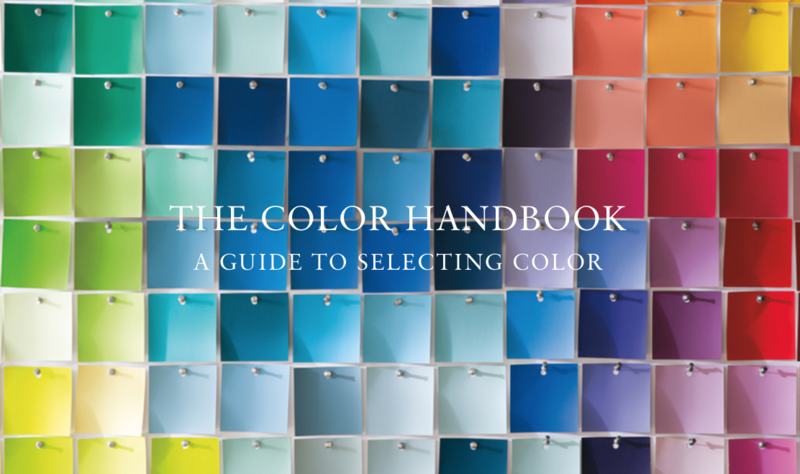 Take a look at our Fresh Pales Colour Book here. 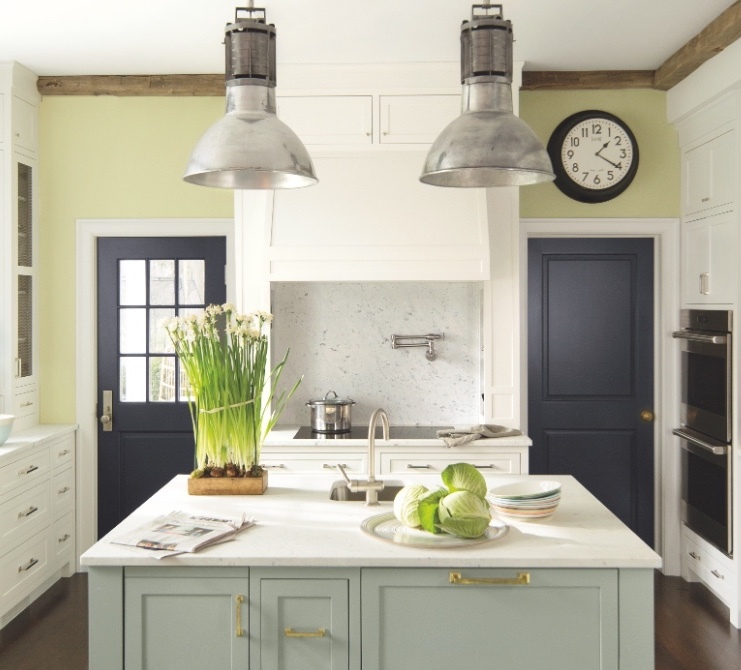 Walls: Fernwood Green 2145-40, Regal Select Eggshell. Doors: Witching Hour 2120-30, Aura Gran Entrance Satin. Cabinets: Flora AF-470, Advance Satin. Its no surprise that earthy, nuanced colours keep you grounded. Neutrals go beyond grey and brown into earthy hues like slate, clay, sand and ochre. Colours in this family can be warm or cool, but they are always reliable and level-headed. And because they transition beautifully with shifting light, they're a good choice for rooms used throughout the day. 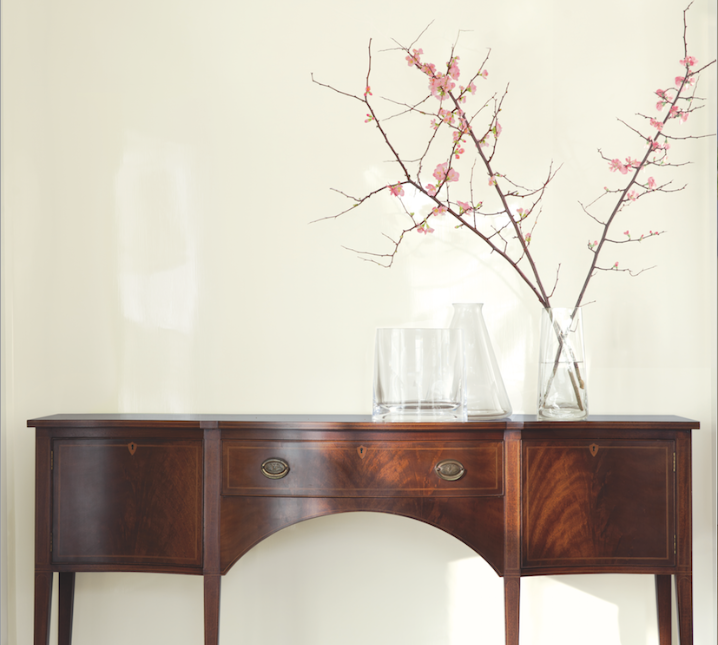 Be inspired by our collection of nuanced neutrals here. Take a look at our Timeless Neutrals Colour Book here. Walls: Intense White OC-51, Regal Select Matt. Woodwork: Ashen Tan 996, Advance Satin. Pure and pristine, these timeless colours offer a blank canvas to express your style. Whites can easily feel contemporary, traditional or anywhere in between. Its an honest, harmonious family of colours and a great place to start, as they complement any style. You might call it a perfect backdrop for the life happening around it. Be inspired by our collection of contemporary and classic whites here. Take a look at our Gentle Whites Colour Book here. Walls: Lancaster Whitewash HC-174, Aura Eggshell. Woodwork: Swiss Coffee OC-45, Aura Semi-Gloss. Ceiling: Chantilly Lace OC-65, Ceiling Paint. 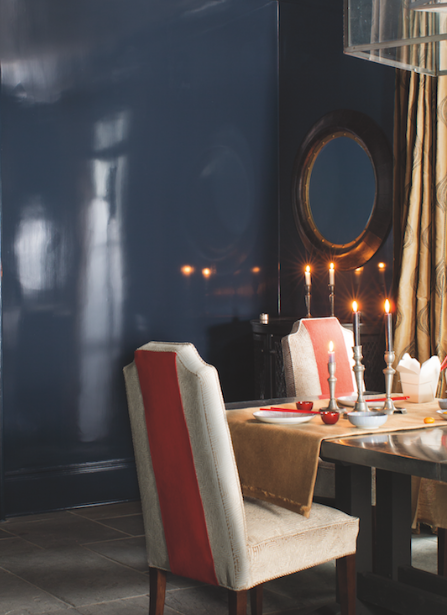 Bring drama to a room with colours that are rich and mysterious. Violet, onyx, sapphire and ruby - even the names evoke something dramatic. Deep colours dissolve boundaries and create depth. They are the opposite of understatement and can fill a room with energy, creativity and confidence. Be inspired by our collection of striking deeps here. Take a look at our Dramatic Deeps Colour Book here. Walls: Chambourd AF-645, Aura Matte. Mantel: Smoke Gray 2120-40, Advance Satin. Light in a room changes many times throughout the day. From the natural light of early dawn to the artificial light of nightfall, the interplay of light and colour is a crucial component when it comes to choosing your perfect paint colours. Experimenting and observation is key. 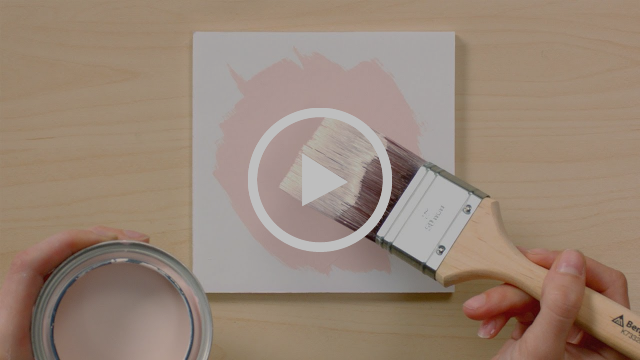 To make sure you choose your colour with confidence, tap into Benjamin Moore's US pint-sized colour samples. With these handy samples, you can paint a board, lining paper or directly onto the wall to see the colour in different parts of the room. Monitor how the paint colour changes at different times of the day so there are no surprises once you've applied your paint colour choice. As seen below, bright midday sun will wash out most pale hues; that same hue will be flattered by softer, indirect illumination, while artificial light will add a warm glow to the wall colour. Read more about how to pick the perfect colour for the light in your room here. The clever use of colour and sheen can influence the sense of space and dimension you feel in a room. Small rooms can appear larger, high ceilings can feel lower, architectural features can be emphasised, open plan spaces can be defined. While its very common to use white on the woodwork alongside a colour on the walls, you can soften the look by selecting a white which shares the same undertones as your wall colour. This technique is great when you want to make the room feel larger because the skirting and coving will appear more recessive than if a bright white is used, and won't draw the eye to the corners of the room. It can be hard to spot the undertones in a white when it is surrounded by stronger shades, so make sure you isolate your swatches or samples from other strong colours and compare a few whites together to make the different undertones more obvious. Walls: Pleasant Pink 2094-40, Natura Flat. Woodwork: Dreamy Cloud 2117-70, Natura Semi-Gloss. Bathroom wall: Texas Rose 2092-40, Aura Bath and Spa. If you're keen to use a stronger colour in your space, but are worried about making the room feel dark, use our colour scales to pick a lighter and darker tone in the same colour family. 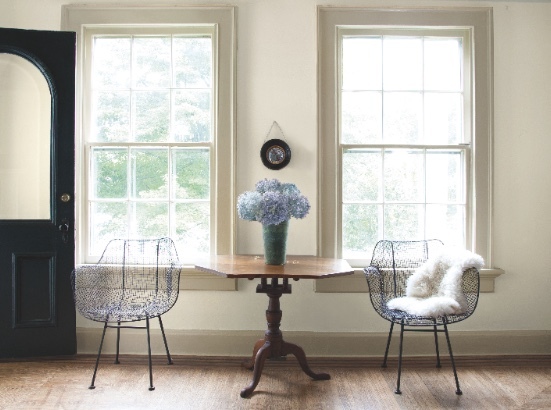 Use the lighter tone on the walls and even ceilings, and darker tone on the woodwork. This will keep the space feeling bright but will give you a contemporary look. With 7 colours in each Benjamin Moore colour family, the contrast between the two shades can be as small or as large as you like. Walls: Winter Gray 2117-60, Natura Flat. Woodwork: Sanctuary AF-620, Natura Semi-Gloss. Chair: Twilight Zone 2127-10, Advance Satin. In an open plan home, use different colours to define different spaces and highlight interesting architectural features. But always keep the big picture in mind - the simplest way to keep things harmonious is to combine shades of the same colour - or tones from adjacent colour families - to give a sense of flow from room to room. Always think about which rooms have a line of sight from each other and be sure to pick tones that work together. Walls: Wolf Gray 2127-40, Regal Select Eggshell. Far Wall: White Opulence OC-69, Regal Select Eggshell. As a rule of thumb, lighter colours tend to receed making a space feel bigger, while darker colours tend to advance, bringing the wall towards you. You can use this to change the perception of space in a room. If you are working with a long narrow space, like a hallway, you can use a darker colour at the end to draw the eye through the space and make the area feel more spacious. Likewise, if you want to make a low ceiling appear higher, using the same colour on the walls, ceiling and coving will give the illusion of more height. Woodwork and panelling: Chantilly Lace OC-65, Regal Select Pearl. Far door: Dinner Party AF-300, Aura Grand Entance High Gloss. Mid wall: Onyx White OC-74, Regal Select Eggshell. 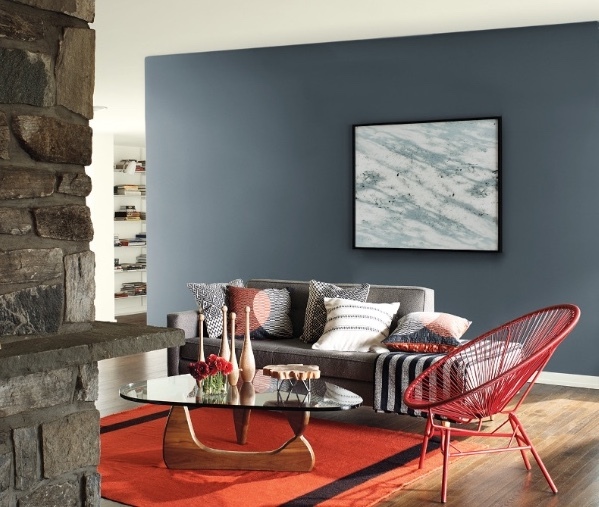 Near wall: Mt Rainier Gray 2129-60, Regal Select Eggshell. 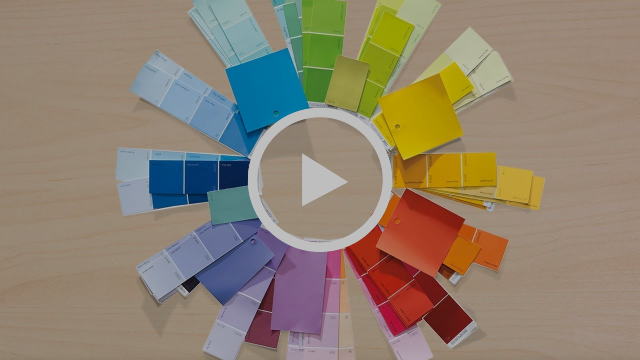 Sheen puts the finishing statement on your colour of choice, and with a line up of 7 sheen levels in the Benjamin Moore range, you can be as creative with sheen as you can with colour. 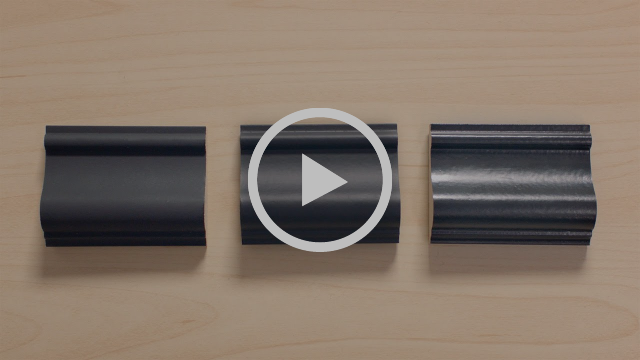 Satin, Semi-Gloss and Gloss - luminous finishes that highlight architectural details. Choosing the right sheen level can enhance your chosen colour. It can also mask or accentuate any different features or architectural details. Painting the walls in a higher sheen level will add dimension and levity. Using a higher sheen for example on a low ceiling will move light around the space and create the illusion of height. From a practical standpoint, remember that shinier finishes look best on smooth, well-prepped surfaces, while matte or flat paints are more forgiving of imperfections. 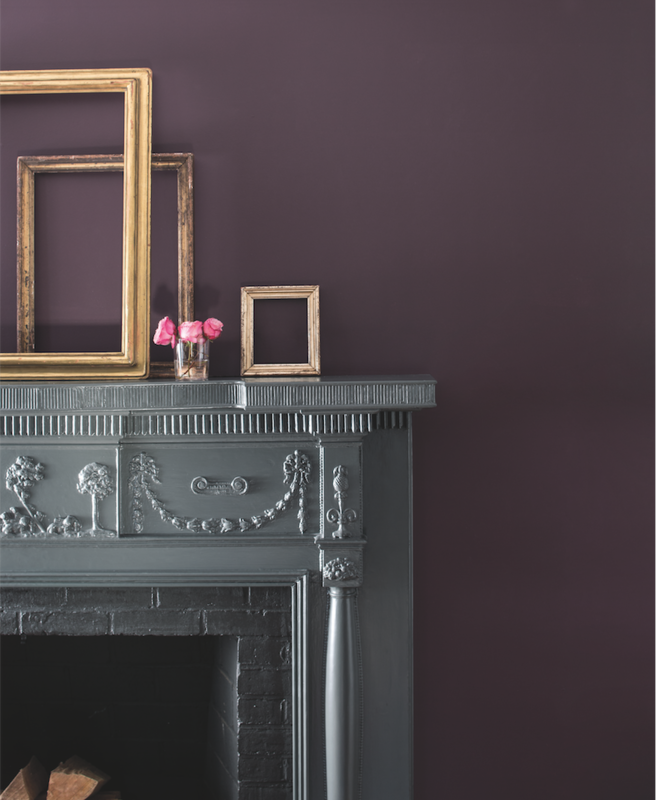 Take a look at the different sheen levels in the Benjamin Moore range here. Walls: Cloud White OC-130, Aura Semi-Gloss. 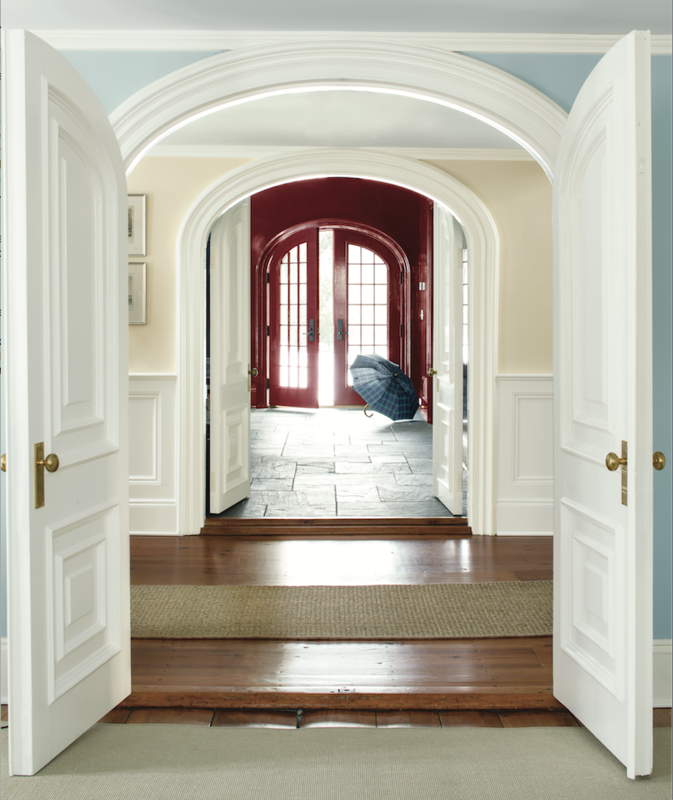 Walls and woodwork: Newburyport Blue HC-155, Natura Semi-Gloss. 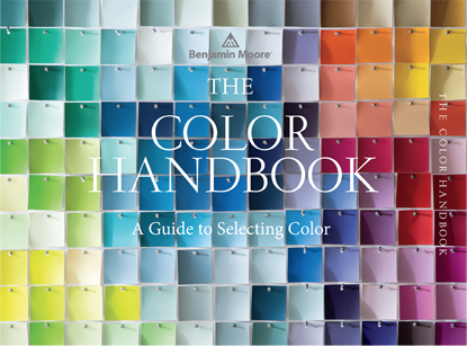 The Benjamin Moore Colour Handbook contains even more inspiration and tips on how to use colour in your home. Click the link below if you would like to be sent a copy.